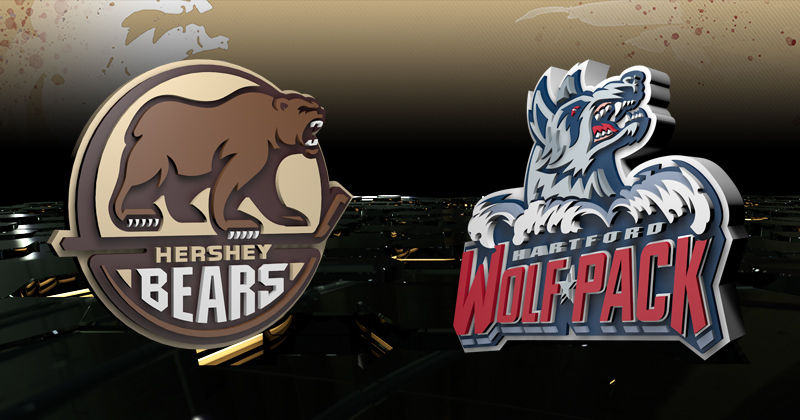 04/14/2019 - Tonight, the Hershey Bears will close the book on their 81st regular season in franchise history against the Hartford Wolf Pack. The Bears will look to sweep the six-game season series against the Wolf Pack (5-0-0-0). RADIO: WQIC-100.1 FM, Fox Sports 1460-AM, WOYK-1350 AM, Zack Fisch, the Voice of the Bears, Freddy Cassivi, and Jim Jones on the call. The Hershey Bears will look to sweep their final three in three of the season after winning 4-1 over the Utica Comets last night at Giant Center. Nathan Walker scored the lone goal in the first period at 14:32 on a sharp-angle bank shot. Kole Lind found the equalizer for the Comets in the second period, but Jayson Megna responded by burying his 20th goal of the season on the power play. Shane Gersich extended the lead in the third period to 3-1, and Lucas Johansen hit the empty net for the 4-1 final. The Hartford Wolf Pack are coming off a 3-2 shootout loss last night to the Lehigh Valley Phantoms. Ryan Dmowski and Lewis Zerter-Gossage scored for the Pack. Last night, Aaron Ness earned two assists to reach the 50 assist milestone for the first time in the blueliners career. Ness enters tonight fifth in the league in assists and first overall among defensemen in helpers, as well as overall points with 55. Ness' previous career-high for most assists in a single season was 37 set in 2014-15 with the Bridgeport Sound Tigers. He is the first Bears player to reach 50 helpers in a season since Chris Bourque in the 2015-16 campaign. Tonight marks the 300th American Hockey League game for Hershey forward Nathan Walker. The Aussie has recorded 139 points (60 goals, 79 assists) as well as 234 penalty minutes in his 299 career games with the Chocolate and White over parts of the past six seasons. He's enjoying a strong campaign, tying his career high in goals (17), and with 38 points in just 57 games, he is only three points off of his personal-best of 41 points, collected in 73 games during the 2015-16 season. Walker enters tonight with four points (three goals, one assist) over his past two games. The Bears announced the recall of defender Joey Leach from South Carolina of the ECHL yesterday. Leach returns to Hershey after skating in 17 games with the Bears earlier this season, registering one assist, six penalty minutes, and a +1 rating. The 6-foot-4, 205-pound Saskatchewan native played in 38 games with South Carolina this season, scoring 28 points (three goals, 25 assists). Leach, South Carolina's captain, also played in two playoff games with the Stingrays. He has appeared in 41 games with Hershey over three seasons, notching seven assists. He also skated in five games with Hartford last year. The Bears conclude a roller coaster regular season tonight after one of the most notable mid-season turnarounds in franchise history. The Chocolate and White began the season with the worst start in franchise history, losing all five initial games in regulation. Hershey was last in the 31-team AHL on the morning of Dec. 21. The tide changed shortly into 2019, as Hershey began to mount a historic, franchise record, 17-game point streak lasting from Jan. 12 to Feb. 23. Hershey officially clinched a playoff berth on Apr. 7 to return to the Calder Cup Playoffs after a one year absence. The Bears are set to open the postseason next week versus Bridgeport. After visiting Webster Bank Arena for two games, Hershey will host Game 3 on Tuesday, Apr. 23, and if necessary, Game 4 on Thursday, Apr. 25 at Giant Center.